Tiger Muay Thai and MMA training camp is but one e-mail away from all the questions you need answered. Our internet & e-mail hostess will be able to answer all your questions and our reservation department assist you through your booking. When you get to the camp we have a full guest relations and concierge department that’s sole job is to look after our guests needs, answer your questions and assist in any practical manner you might need during your stay. Send an email to info@tigermuaythai.com or fill in the form below and we’ll get back to you as soon as possible. Please also read through our F.A.Q as you will find the answer to the most common questions there, thanks. 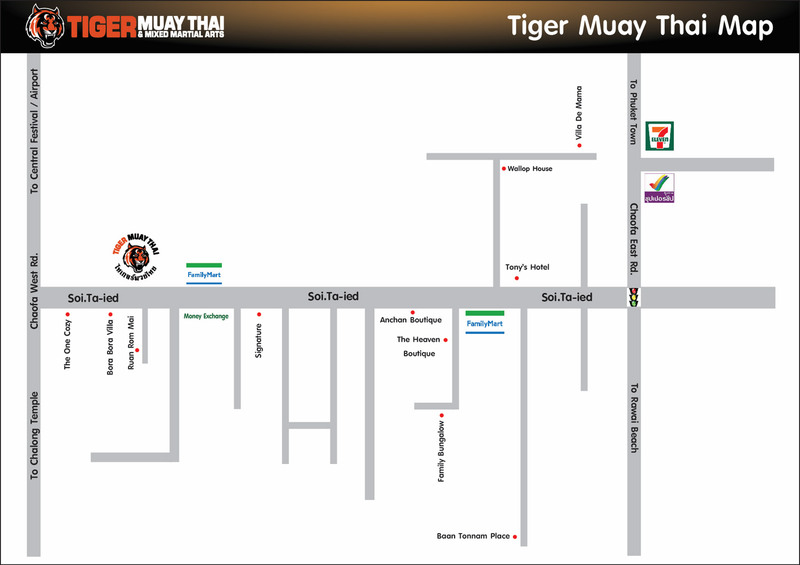 Tiger Muay Thai & MMA in Phuket is located in the Chalong Area at 7/35 Moo 5, Soi Ta-ied. Take a look at our simplified map of the area or download the “taxi driver” card with a map and Thai writing.